Feedback Factory - a JOOMLA Extension that allows you to add UserVoice similar functionality to your website. And the best part - It' FREE ! You can download it from our homepage (follow the link on top) or check out the functionality in this demo server. You can even login into admin section! Don't loose track of your user/customers feedback! Let the community decide which feature is the most popular! Create easy user polls with Commenting and Voting features. And all this for free and with no strings attached. 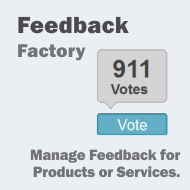 Feedback Factory is open source and easy to customize.